The MLB (Major League Baseball) Season has just kicked off, and since New Balance is a big presence on the diamond, they have teamed up with Concepts, who have stores in both New York and Boston, for a baseball-inspired pack. 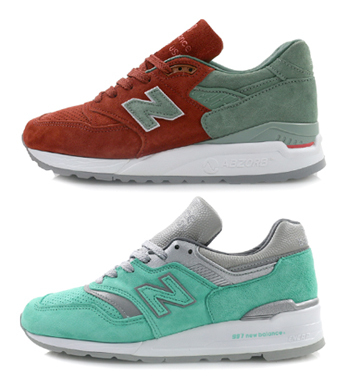 The City Rivalry Pack is composed of a 997, that represents the New York Yankees, and a 998, which is a nod to the Boston Red Sox. The 997 takes inspiration from the Statue of Liberty, with a predominantly green upper, broken up by hits of silvery grey. As a finishing touch the insoles are inspired by Cracker Jacks, a snack consisting of molasses-flavored caramel-coated popcorn and peanuts. On the other hand the 998 sports a mix of rust red and low saturation green, which is a colour combination seen on Boston’s famous Yawkey Way.